Step inside this fifth grade classroom as they learn to elaborate. These fifth graders were working on a “Research-Based Position Paper” for their unit of study on opinion writing. Basically, a Research-Based Position Paper means they read about two sides of an issue and then write a paper expressing and supporting their personal opinion. Some of the issues they studied were: Are professional athletes overpaid? Should cursive writing be taught in schools? Or, are video games good for you? First, the students took notes using a boxes and bullets organizer. 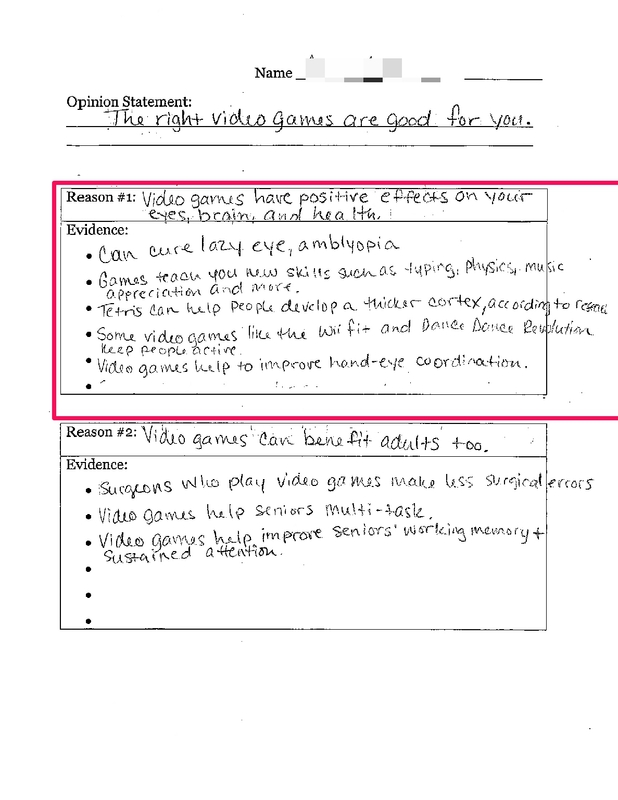 Here you can see the teacher’s note-taking sheet for her position that the right video games can be good for you. I can elaborate my bullet points by writing more. 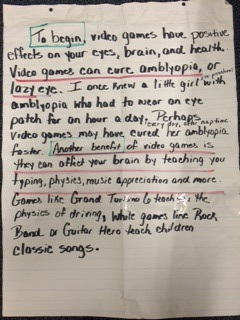 Our first bullet point is underlined in red marker: Video games can cure amblyopia, or lazy eye. This came directly from our note-taking sheet. I wrote: I once knew a little girl in preschool with amblyopia who had to wear an eye patch for an hour a day, everyday after nap time. Perhaps video games may have cured her amblyopia faster. Then we moved on to our next bullet point, underlined in red on the chart paper: Another benefit of video games is they can affect your brain by teaching you typing, physics, music appreciation and more. “How can we elaborate by writing more here?” I wondered aloud. After a few more examples were shared, I wrote: Games like Grand Turismo 6 teach you the physics of driving, while games like Rock Band or Guitar Hero teach children classic songs. This was our first lesson on elaboration, and we hope their writing will become more sophisticated over time. Through the use of personal stories, examples, comparisons, quotations and other types of details, the fifth graders learned how to elaborate by writing more. 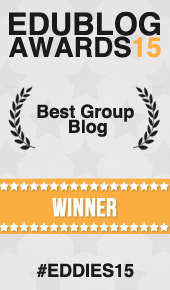 Dana, I found this incredibly helpful. I love to see the process and how you move from outlining to elaborating, right in front of the kids with their input, naming what you are doing as you do it. The teachers in your school are so lucky to have you. Love this! I find that I don’t always know what to do next but doing the writing leads you in the right way. Thanks for allowing us to step into this fifth-grade classroom with you. I look forward to seeing the outcome of these lessons (if the teacher’s students are willing to share with us).